Self Dumping Hoppers automatically dumps load when bumper release contacts the side of the trash dumpster. Hopper returns to an standing and locked position automatically after it dumps it load. All forklift self dumping hoppers includes a cable that may be operated from the seat of the fork truck to manually dump the hopper. A safety control is provided to secure the hopper to the fork truck. Usable fork pockets are 7½"W x 2½"H. Optional leak proof design sold separately. ER-D-25, ER-D-33, ER-D-50, ER-D-75, and ER-D-100 are stackable if you stack the top hopper turned 90° from the bottom. Blue baked-in powder-coated is standard with exception of models ER-D-300-HD-NA, ER-D-350-HD, ER-D-400-HD & ER-D-500-HD. Must be attached to forklift when dumping. Self Dumping Hoppers For Forklifts. By investing in self dumping hoppers it is possible to ensure that materials are properly stored and if necessary, disposed of in a safe and simple manner. These modern hoppers fit onto most standard fork lifts and will allow for materials to be moved from one location to another and then dumped in a matter of seconds. In simple terms, a self dumping hopper is a large box on a hinged base that is filled with waste products in the workplace. When the hopper is completely filled, it can be picked up on a standard fork lift and then moved to another location. While still in situ on the forks, a mechanism can be released that will allow the hopper to pivot forwards and allow the contents to be dumped. In essence, attaching a hopper in this way extends the functionality of a forklift into a utility truck at a comparatively low cost. Thanks to high quality construction and sensible design precautions, the whole range of self dumping hoppers offer complete security in use, and are able to be manipulated to prevent accidental loss of contents in transit. With a range of different capacity hoppers available, every workplace need is fully covered. From relatively small 2,000lb containers through to hoppers with a capacity of 6,000lb, whatever your needs, there is a model to suit you, and they come in a range of styles that are ready for many different purposes. Depending on the capacity of hopper that you require, and also the range of uses that you need it for, there are a number of models available. You can chose from hoppers with a full 90 degree tilt to ensure complete discharge of waste when dumping, or more restricted hoppers that rotate forwards a smaller amount, giving more control of the pour. You can choose open fronted hoppers that are designed to carry waste such as crushed boxes and long planks of wood, or deeper fully contained versions which are suitable for dust and even liquids. 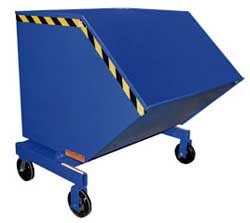 Most self dumping hoppers feature a fully laser welded construction that prevents any leakage in use. In order to facilitate easy installation, the self dumping hoppers feature a simple release mechanism that only requires a cable to be run from the hopper into the cab and then pulled when in the correct position. A spring then ensures the smooth return once the load has been dropped. For a long life and to ensure that they remain hard wearing, the hoppers produced by Easy Rack are powder coated and made using high precision robot welding for a leak free finish that will last. The base of the hoppers is ¼ inch steel for added strength in use. The simple mechanisms are precision made for a smooth action in use, and additional reliability. Additional options that can be added include casters for easier movement around the workplace when being filled, and hard wearing poly plastic lids to keep the contents from spilling out, and to create a much tidier environment. 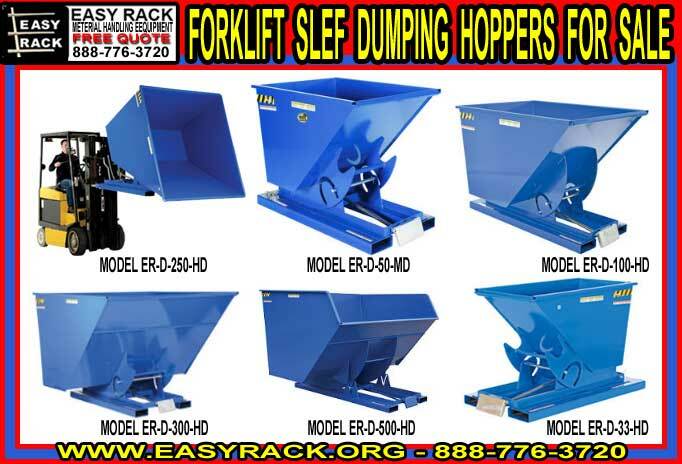 As you continue to read through our selection of Industrial Steel Self Dumping Hoppers, keep in mind we stand ready to answer any questions you may have about our offerings. Easy Rack carries a wide variety of commercial shelving, material handling equipment, commercial lighting, used pallet racks, and modular prefab buildings installed nationwide. If you can not find what you are looking for call us toll free at 1-888-776-3720 and we will find it for you. Our home office is located in Houston, Texas with regional distribution centers located in all 50 States including New York NY, Los Angeles CA, Miami, FL. Chicago, IL. Denver CO., Dallas TX, San Antonio, TX, Austin, TX, Boise ID, Atlanta GA, Albuquerque NM, Raleigh-Durham NC, Washington DC, Albuquerque NM, Huntsville AL, Fayetteville AR, Norfolk VA , Madison WI, Jersey City, NJ Newark, New Jersey. Industrial & Commercial Heavy Duty Crane Lifted Waste-Garbage Skip Trash Containers. 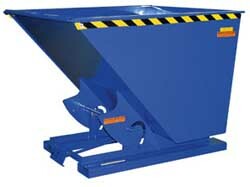 A crane garbage-trash skip is a 4X10 steel box with one end sloped. It attaches to a crane, and it is used for transporting a variety of loose materials. Self dumping steel hoppers offer you the ability to carry large quantities around in a single trip, and present the easiest possible method of unloading when necessary. Self-Dumping Steel Hoppers automatically dumps when bumper release contacts side of dumpster. Hopper returns to an upright and locked position automatically after it dumps.